In keeping with our country’s long tradition of peaceful protest at sea, the Oil Free Seas flotilla will confront Anadarko’s oil drilling ship over 100 nautical miles off the west coast of New Zealand in the coming weeks. The flotilla will set sail in the next few days from Auckland, Wellington, Kaikoura, Bay of Islands and Bluff, and will head to the drilling site, which is 110 nautical miles west of Raglan. Texan oil company Anadarko is due to start drilling around the middle to the end of November, using the previously untested drill ship the Nobel Bob Douglas. The flotilla, made up of 7 boats, is a loose association of individuals and boat owners who oppose deep-sea drilling and the new legislation that takes away New Zealander’s long-standing right to peacefully protest at sea. One of the boats taking part, the Vega, also sailed against French nuclear tests in the Pacific. “We love New Zealand, and this country is what it is because kiwis have stood up for what we believe in. I was on board the SV Vega protesting against French nuclear testing in the Pacific in the 70’s. Nuclear testing in the Pacific wasn’t right and deep-sea oil drilling in the Tasman is not right either. 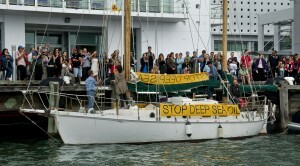 We will not be bullied into submission by big oil or dubious laws,” said Anna Horne of Oil Free Seas Flotilla. “By being there we are saying to Anadarko that they are not welcome here doing this kind of activity. This law suits the suits, but not the environment and the wishes of the people of New Zealand” said Anna Horne. 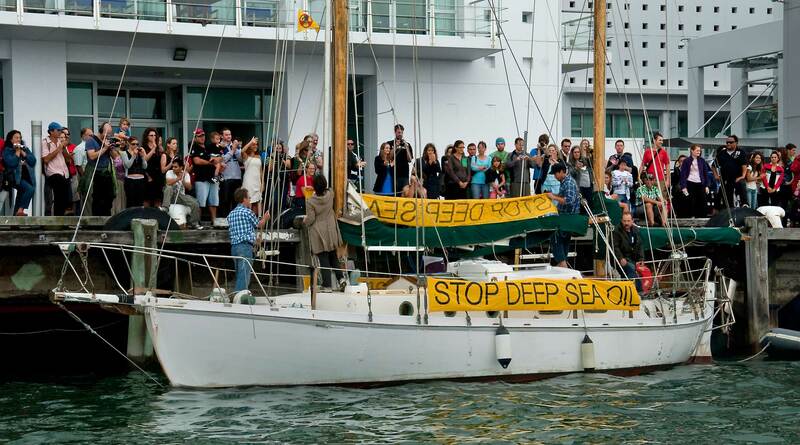 The Oil Free Seas flotilla will depart from ports around New Zealand from Friday. The launch events are as follows and we would like to invite all New Zealanders to grab a banner and come along. The Anadarko Amendment states: that it is illegal to interfere with any structure or ship that is in an offshore area that is to be used in mining activities, with an exclusion zone of 500 meters. The flotilla is fully aware of the law and we intend to protest peacefully and safely. But we care what happens to our marine environment and coastlines. We will raise our voices loudly against deep-sea oil exploration and the law restricting our rights to protest at sea. There is a history of seafarers taking their boats out to protect their environment. One of the more recent was the flotilla of boats that departed from the Pacific rim counties to sail into the pacific to protest and stop French nuclear testing at Moruroa Atoll. These peace flotillas set out year after year and eventually in 1995 the testing was brought to a halt. 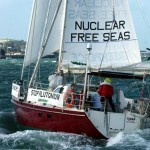 In New Zealand the Peace Squadron made up mostly of small local vessels set out time and time again to protest against the arrival of nuclear-armed or nuclear-powered vessels into their ports, and large thanks to them New Zealand is now nuclear free. 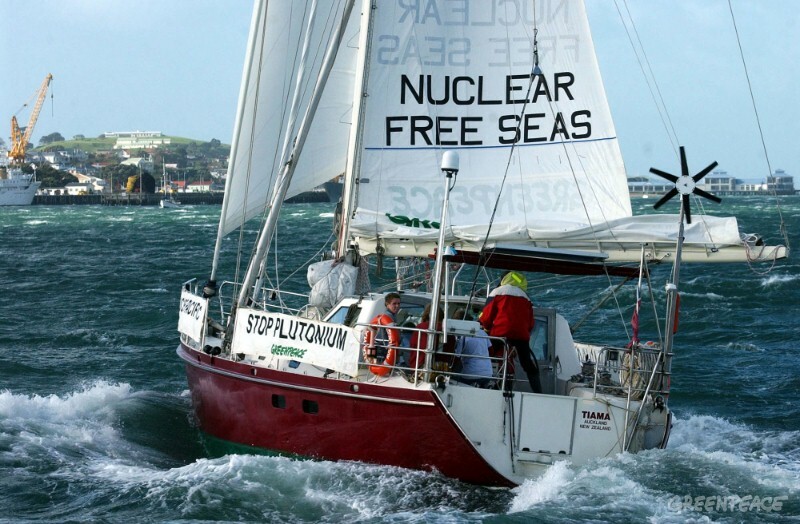 In 2001 a flotilla of small sailing vessels set out form Australia and New Zealand set out into the Tasman Sea to peacefully protest the transport of MOX (mixed oxide fuel) plutonium fuel through their waters. The idea was to make these ships of death visible, and to raise awareness that up to 80 of these shipments are planned over the next 10 years. This protest helped strengthen the resolve of the people in Japan who live around the first nuclear power station planning to load MOX plutonium fuel. They held a referendum and managed to block the loading of MOX. To date not a single light bulb is lit up in Japan by MOX plutonium fuel. In June 2002 another shipment of Plutonium came through the Pacific. This time it was faulty MOX fuel being sent back from Japan to the UK. 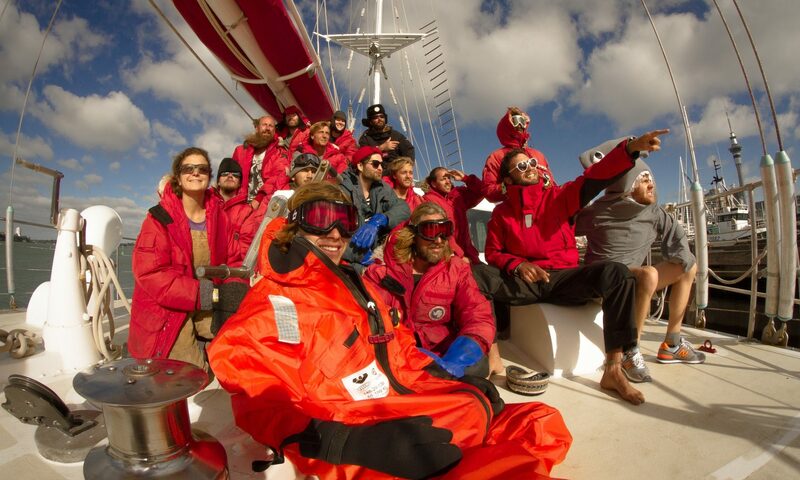 A flotilla of 11 boats from Australia, Vanuatu and New Zealand set sail into the Tasman Sea. This time the two 100 meter- long armed plutonium carriers actually stopped for the flotilla and waited until the middle of the night to sneak through the line of nuclear free seas flotilla boats. One wonders what these ships have to hide that cannot see the light of day. At the same time there was also a flotilla of 5 boats waiting of Cape Horn in case the ships chose that route to go to Europe instead of via the Cape of Good Hope. 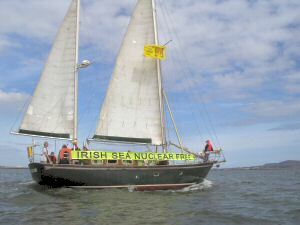 A Nuclear Free Irish Sea Flotilla, formed by people concerned about nuclear transports and the operations of the Sellafield nuclear site in Cumbria, UK, prepared to peacefully and lawfully protest the faulty MOX transport. When the faulty MOX plutonium-carrying freighters entered the Irish Sea a flotilla of 13 boats forming a symbolic chain across the entrance of the Irish Sea awaited them. 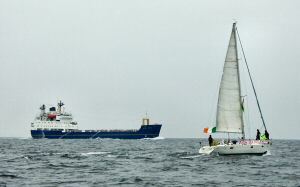 The two plutonium-carrying ships sailed straight through this only to encounter another flotilla of 10 protest yachts was at the entrance of the port of Barrow. These protests were very successful in getting the message across to the various governments and the nuclear industry. No MOX plutonium fuel has since been transported along this route.